Unalaska’s tallest building? KUCB/John Ryan photo. The biggest cruise ship ever to visit the Aleutian Islands pulled into Unalaska’s Dutch Harbor Tuesday morning. The floating city known as the Celebrity Millennium disgorged about 2,500 passengers and 1,000 crew. 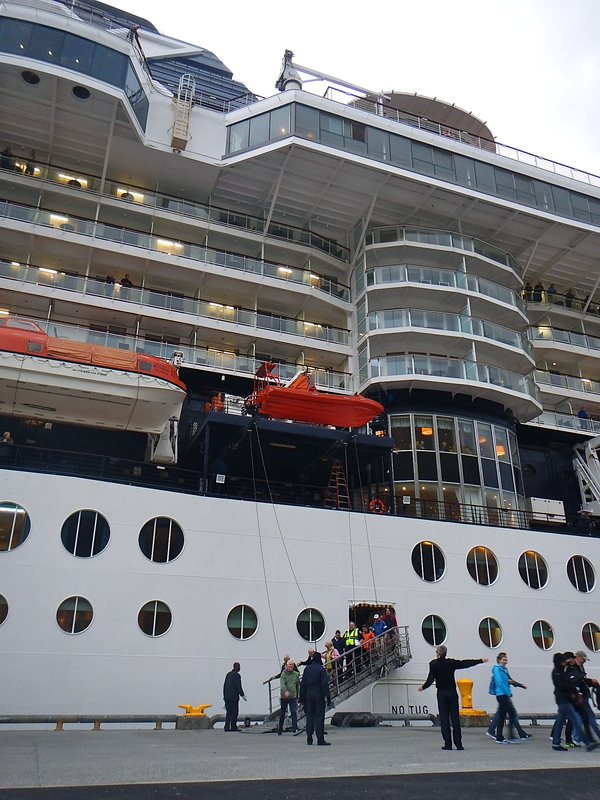 In tandem with nearly 300 passengers in town from the much smaller Le Boreal, the two cruise ships nearly doubled the population of Unalaska for the day. For many towns in southern Alaska, the arrival of a mega cruise ship would make for an ordinary or even a slow day for tourism. Juneau can handle five big cruise ships at once. But those towns along the main cruise corridors have infrastructure for a deluge of wandering pedestrians seeking entertainment. Unalaska does not. Starting about 10 a.m., passengers walked down the ramp from the Millennium onto an industrial dock. The floating city’s P.A. system blared a welcome to Dutch Harbor and safety messages at its passengers. They learned, as they prepared to walk off the ship for the first time in three days, that Dutch Harbor isn’t really set up for pedestrians, let alone large numbers of them. “When leaving the dock and heading away from the airport, there is no paved walk area. Please be very mindful of industrial traffic,” the announcer advised. A small number of passengers started a long and windy walk into the center of town despite the lack of sidewalks. Many more hopped on board the buses, taxis and rental cars lined up at the dock. Unalaska Fire chief Zac Schasteen said there were no problems with tourists wandering into the wrong areas of the nation’s busiest commercial fishing port. The arrival of the supersize ship sent town officials and many volunteers into a flurry of activity, especially in the past month, after officials learned there would be hundreds more passengers than they’d first been told. “We’ve been kind of sounding the alarm, so to speak, for at least a year,” Cathy Jordan with the Unalaska Convention and Visitors’ Bureau said. Despite an “overwhelming” number of visitors, Jordan said the day went smoothly. “I am just thrilled with the outpouring of support from the community,” she said. An estimated 200-300 of the passengers showed up at a crafts and souvenirs market set up inside the town gym. Local artist Carolyn Reed said she sold enough postcards and jewelry to be worth her time, but it wasn’t a huge boost to her business. Across the street, the Unalaska School District charged $10 a head for a program of traditional Unangan, or Aleut, culture. Patty Gregory-Lekanoff showed off bentwood visors and other traditional clothing to the dozens of visitors sitting on bleachers in the high school gym. “What I’m wearing feels like wax paper, but this is the intestine of a walrus,” she said. Unangan dancers performed, and young athletes performed high kicks and other Native Youth Olympics events. Unalaska’s physical and electronic infrastructure wasn’t built to handle many hundreds of tourists showing up at once. The Millennium started in Vancouver and is headed to Shanghai by way of Japan. Unlike Unalaska, the giant ship has its own movie theater, a spa and an internet café. Unalaska officials asked the ship to have its passengers put their phones in airplane mode while they’re here. Otherwise, their quest for connection might overwhelm Unalaska’s phone system. Passenger Bob Knobbe from Saskatchewan said word did trickle down to the passengers. He showed a reporter that his phone was indeed in airplane mode. Other passengers could be seen in walking through town, tapping and staring at their phones. Parts of Unalaska had internet service outages in the afternoon, but it’s hard to know if that was because of the large number of visitors, or just another day in Unalaska, where cell service is often unpredictable. A warming Arctic could lead to more ships passing through the Aleutians for business and pleasure. If so, Unalaska will face choices about what kinds of ships it wants to welcome and whether to embrace industrial-scale tourism as well as industrial-scale fishing.